In my previous report on the Vietnam scenario, Operation Starlite, the US Marines had just uncovered and eliminated a VC political support section near Chu Lai. With that out of the way, the Americans now have bigger fish to fry as they attempt to hunt down and destroy an entire VC regiment. Reports have indicated that the unit has pulled back inland towards the more rugged terrain. 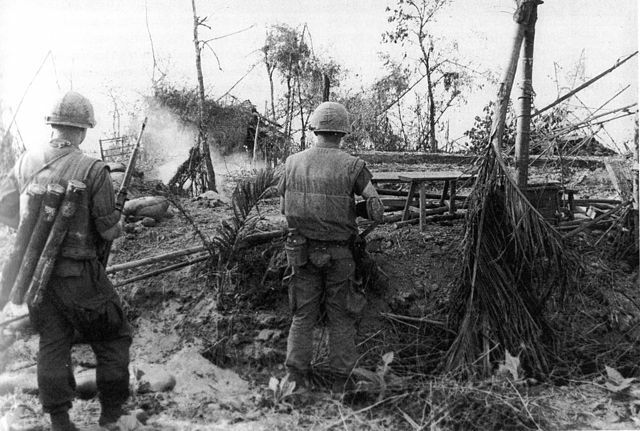 The rest of the Marines in Quang Ngai province are about to come down hard on the enemy. The US player declares a Search and Destroy operation in which the rest of the available Marine battalions (2/4 Marines in hex 5118 and 1st Marines in hex 5220) and the HQ will participate. He then chooses 4921 as the Target Hex. All available support is on call for this operation - the 4 air points, the cruiser, and the airmobile point. 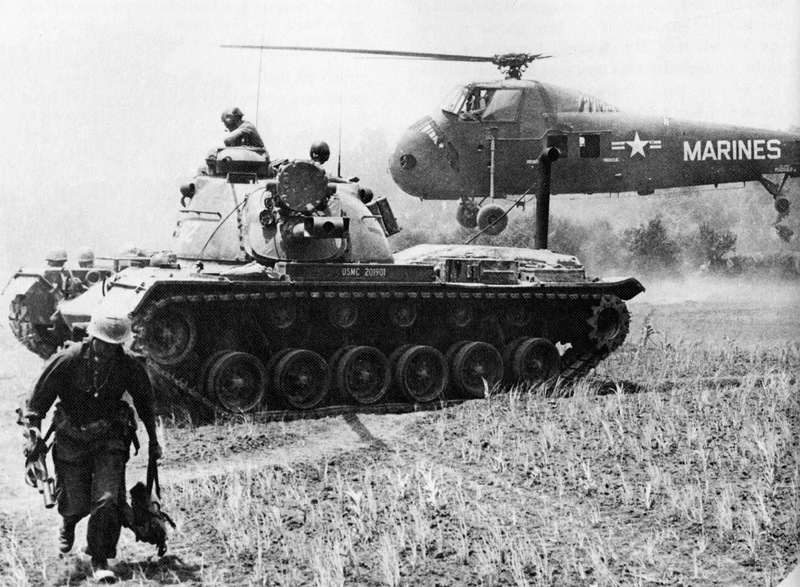 "Operation Starlite" is the first scenario for Victory Games' Vietnam: 1965 - 1975 (1984). The scenario is based on the historical battle between the Vietcong and the United States Marine Corps in the province of Quang Ngai in August 1965. It marked a significant point in the beginning of the war as the battle here was the first wholly American effort of this size. Through some clever planning and careful coordination among air, naval, and ground forces, the Americans held the initiative in the battle and delivered a significant blow to the 1st VC Regiment by the end of the operation. Some readers were curious about how the rest of the turn played out for the Iranians as they attempted to clean out Kuwait and hit out at Saudi Arabia. Let's do this! For the first part of turn 2, Iran's air force hammered on the Saudis, who had blundered by predicating their entire defense plans around their early warning aircraft (which was promptly shot down by Iran at the beginning of the turn). With Saudi Arabia's air force blinded and the ground units at the front out of supply, the Iranian player licked his chops as the battle on the ground continued. Here's how things stood before the ground forces engaged. Last turn, the Iranians pushed into Kuwait and eliminated the Kuwaiti 1st Armored Brigade while the 2nd Armored Brigade put up a surprisingly stiff defense against overwhelming odds. The Kuwaiti player, with his air force completely obliterated, had no chance of holding out much longer against the Iranian armored divisions that were quickly knocking on the doorstep of Kuwait City, help by a single regiment of Kuwaiti Military Police and an HQ unit. The Kuwaitis moved their 3rd Mechanized Brigade up north to help delay the Iranian 6th Mechanized and 4th Armored Divisions. "Goooooooood morning Vietnam! It's 0600 hours. What does the "O" stand for? O my God, it's early!" Well, this thing just arrived the other day. 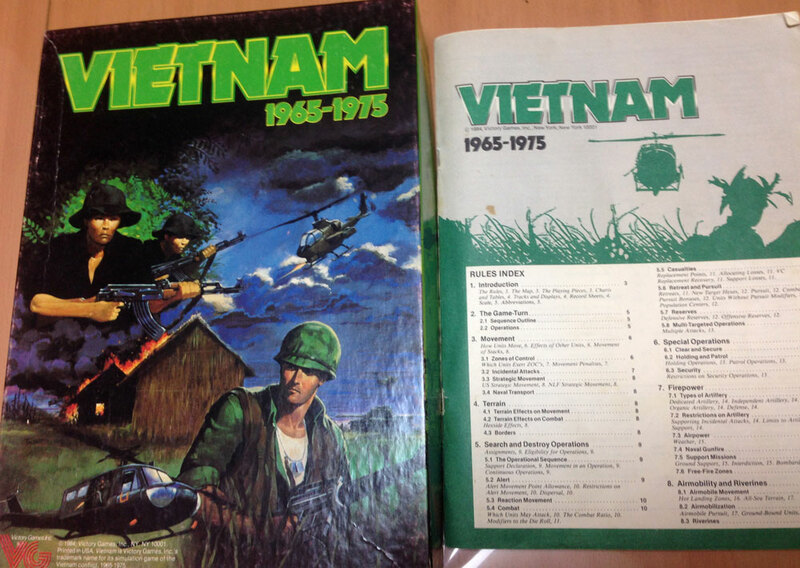 Nick Karp's Vietnam: 1965 - 1975 was published by Victory Games and released in 1984. Although I've never played it and I haven't really even done more than scan the rulebook, I've read lots about it. The game is a faithful attempt to model the political and military involvement of the United States during the entirety of the American major involvement in the Vietnam conflict and it features a huge monster of a campaign game (although there are smaller scenarios in there too). In my previous post, I talked about the general setup for scenario one of Gulf Strike, which involves Iran going to war against the Gulf Council nations in the mid-80s. Iran started off the game with plans to invade Kuwait. Three groups of ground forces were assembled near the Iraq-Kuwait border (Iran has taken over Iraq and made it a vassal state after winning the Iran-Iraq war). Before their troops rolled in, however, the Iranians sent three strike packages of F-4 Phantoms in to bomb the Kuwaiti air base. 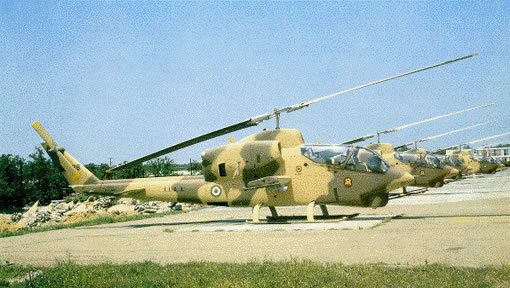 Although it met some light resistance, the Iranian Air Force pulled off an outstanding job and completely eliminated the base. With the Kuwaitis grounded, it was time to begin the ground war. I seem to be stuck on Victory Games products lately so why not do a round of Gulf Strike? Designed by the venerable Mark Herman, this game was published by VG way back in 1983 - more than thirty years ago (don't you feel old now?). 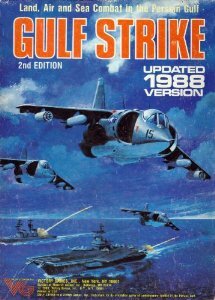 Gulf Strike was an interesting attempt to deal with land, sea, and air combat in a major war in the Middle East during a time of growing tension between the superpowers. As the decade wore on, Gulf Strike players were treated to a 1988 update as well as a Desert Shield expansion in 1990 after Saddam Hussein brilliantly decided to invade Kuwait. It's worth noting Gulf Strike and its designer's role in the actual predictions and planning involved in the real Gulf War in 1991 and you can read more about that here.